Operators of a Devon ferry which broke loose from its guide cables in a storm with 36 passengers on board have been praised for their approach to safety. The Higher Dartmouth Ferry broke its moorings and floated down the River Dart towards the sea in gale-force winds last month with 15 cars on board. The Marine Accident Investigation Branch praised its staff for their safety management during the situation. It also recommended improvements for securing chains and anchor deployment. The ferry, which has been in operation since 1960, runs on two thick steel guide cables and transports cars and passengers between Kingswear and Dartmouth. The cables are attached to heavy weights to keep them taut. But the combination of tides and winds put them under too much pressure and they snapped, casting the paddle-driven ferry adrift with no means of steering. 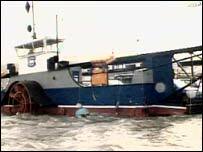 After the ferry broke free, the crew secured the vessel to a buoy before the passengers were taken onshore by lifeboat and another ferry. The cars on board were retrieved the next day and divers had to search the riverbed to locate the broken cables. The Marine Accident Investigation Branch's recommendations included suggestions to improve how ferry staff secure guide cables on river banks.